Are you ready for another blast of cold air and snow? The storm system currently bringing rain to California and snow to the Rockies will soon bring freezing temperatures and heavy snow to the Heartland. 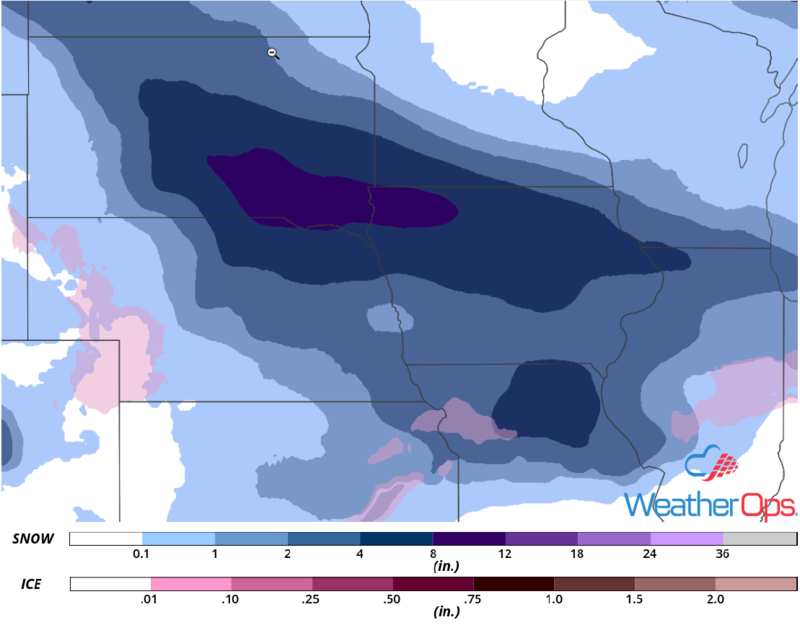 Significant winter weather is forecast over portions of the Plains into the Midwest on Friday. Forecast guidance shows a large area of moderate snow will move from northwest to southeast during the day and evening and will produce a large area of moderate snow accumulations in its wake. Widespread accumulations of 3-6 inches of snow are expected, with locally higher amounts over 8 inches within heavier bands. As the snow tapers off Friday evening into Saturday morning, frigid cold wind chill temperatures will set in for the duration of the weekend. The Kansas City Chiefs will be hosting the New England Patriots for the AFC Championship on Sunday evening. While not as snowy as the last home game, it will be brutally cold. However, it is doubtful to reach any records. In January of 1982, the AFC Championship game between the Chargers and Bengals experienced wind chills down to -37°F. Our WeatherOps forecasters have been keeping a close eye on Arrowhead Stadium. Daily Planners are regularly produced, so camera operators working at the AFC Championship game are adequately prepared. A Hazardous Winter Weather Watch has also been issued due to the snow and cold temperatures expected. 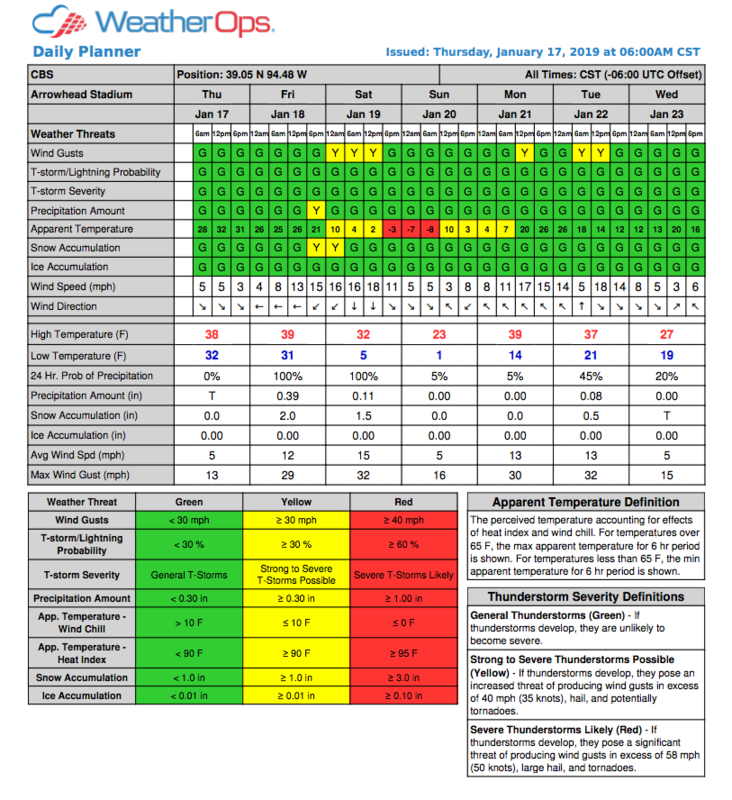 Wind chill temperatures on Sunday morning are expected to be below zero and then will warm into the single digits by game time. 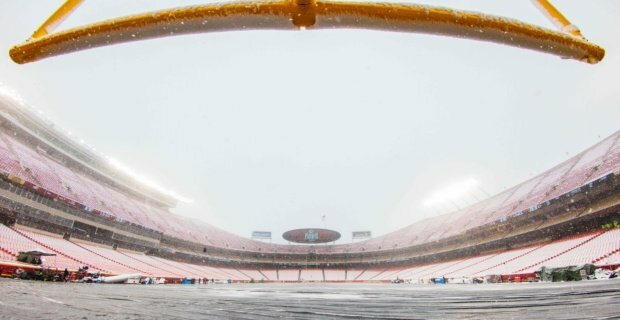 While currently supposed to be dry, Friday and Saturday will bring multiple inches of snow to the stadium. Those tailgating or attending the game will need to make sure they are appropriately dressed for the cold.